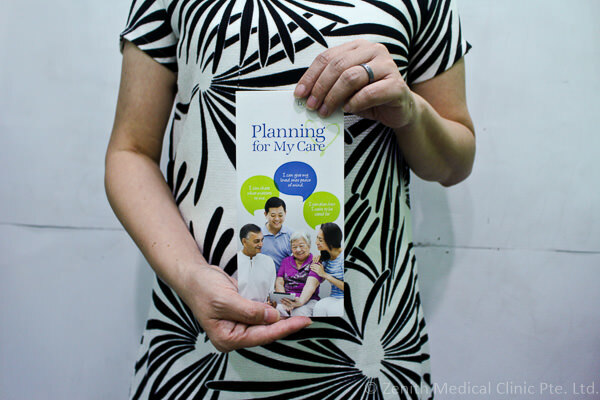 Advanced care planning (ACP) is an interesting “new” concept whereby we learn to embrace the inevitable future. Our doctors are certified ACP facilitators and will be able to bring your or your family member through a heart-warming and engaging conversation. Strictly by appointment only (1 hour minimum, sometimes few sessions). If you are looking for Eldershield/IDAPE assessment, go here. The process generally starts when a person (doesn’t have to be a patient, can be anyone walking on the streets) realises that he/she will not live forever and there is a good chance <ref> that he/she might lose mental capacity <link> while he/she is still alive. Losing mental capacity <link> can take the form of losing the ability to speak, listen, weigh information or maintain concentration. Sometimes, it can be plain losing consciousness or coma. Or in other cases, a precipitous life event (like a sudden medical illness) can occur that requires the patient to be completely put to sleep in preparation for surgery or further treatment. In times like this, the medical team will do “whatever it takes” for the patient. “Whatever it takes” normally sounds like a good option for most people, but for some unfortunately, this may be contrary to what they want. Don’t get it? Don’t worry, most people, even many of my nurses, don’t get this sometimes. For example, the doctor can decide to do “whatever it takes” to keep the patient alive by doing many medical interventions, but the patient can sustain many complications <link> from these treatments. <link> Alas, the patient pulls through and gets to live a few more months or years. But life will never be the same again for most people. The patient might look like this <pic>, or this <pic>. Surely there is nothing wrong with this if the patient is able to accept the loss of many some functions just to stay alive. However, I’m sure that some of us might balk at this idea and would beg the doctors to give us a “trial of limited treatment” instead of “whatever it takes”. The ACP is a culmination of a series of discussion between the ACP facilitator, the patient and the nominated health spokesperson whereby the health preferences are written down and shared. It is NOT a legal document. The general decision comes down to whether the patient (not the family member) prefers the doctors to do “whatever it takes”, “trial of limited treatment” or “let nature take its own course”. Along the lines of ACP, there is also the Advanced Medical Directive (AMD). The AMD in contrast is a legally binding document whereby once TWO different doctors decide that a patient has a TERMINAL ILLNESS, LIFE SUSTAINING TREATMENT will not be provided. It sounds like a great idea, but in actual fact, on the ground, doctors have a lot of difficulty evoking this law and according to this article, less than 10000 had signed up by 2008. Normally, as part of the ACP discussion, I will also get the patient to sign this form if he/she is keen.